#etsy Baby Bracelet Engraved, Personalized bracelet for Little Girl, Baby Jewelry, Personalized Baby Toddler Name Bracelet, Baby gift. Baby Bracelet Engraved, Personalized bracelet for Little Girl, Baby Jewelry, Personalized Baby Toddler Name Bracelet, Baby gift. 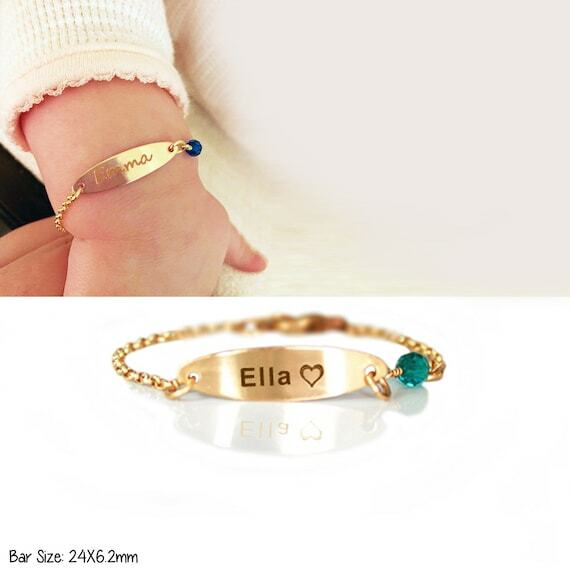 These high quality hand-made baby bracelets have been made in plain without stones or with mystical birthstones . Looks Glossy and alluring, available in 14k Gold filled and rose gold filled, looks like real gold doesn't turn color and has no allergy with sensitive skins, Soft and polished edges. Personalized baby, toddler, kids or little girl bracelet. it can be personalized with any name or text, initials, birthday, roman numerals or etc. Engraved with your favorite font or symbol. The perfect custom jewelry gift!